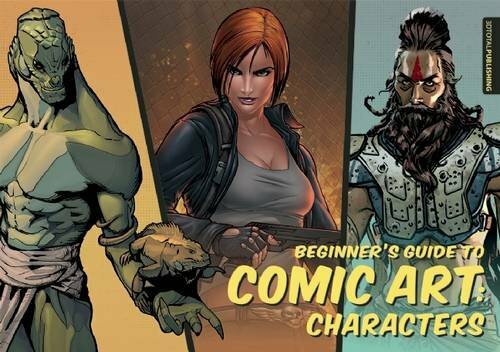 This book focuses on creating characters for the comics medium. The book's split into two parts. The first talks about the essential skills you need. This would be tips on drawing the body, faces and poses.. You'll get to learn the figure drawing basics from Steve Rude, inking from James Goodwin and colouring from Sean Ellery. Second part has character projects by other artists. Each character is in a different style so you get to see and learn to draw in a variety of style. Most of them are using Photoshop for digital drawing. But the concepts of drawing and colouring can easily be replicated with other software. So you're essentially learning the process and see how these professional artists do it. And finally at the back are several pages of short tips on how to draw things like weapons, materials, effects and textures. Overall, it's a great book for beginners who want to learn more about drawing comic characters. It's also inspiring to see the styles of different artists, and also their workflow. Goes to show that you can develop your own style. This book works best as a complement to other figure drawing books because Steve Rude's tutorial focuses more on the features. There's mention on poses but you'll learn more from other dedicated books. The book is relatively affordable and at 208 pages, it's quite worth the money.